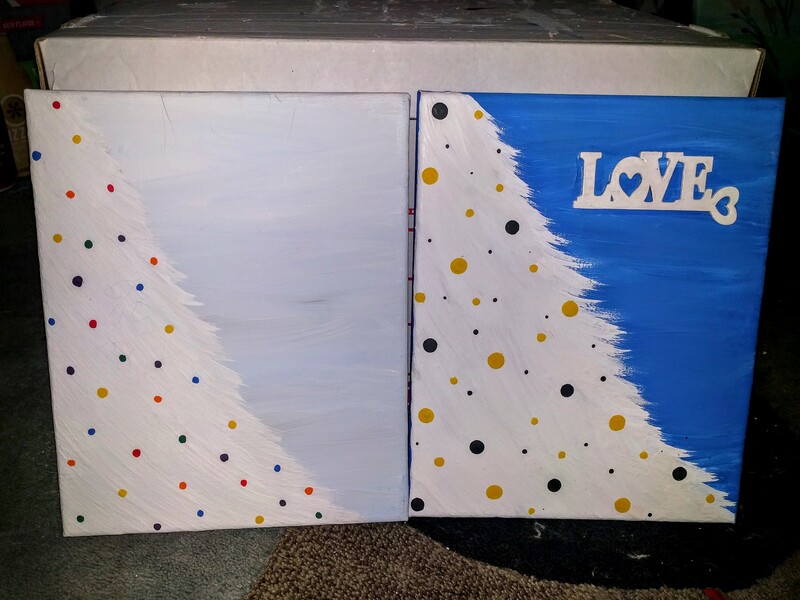 WINTER TREES THREE AND FOUR: I have really good reasons why I painted four winter tree canvases. 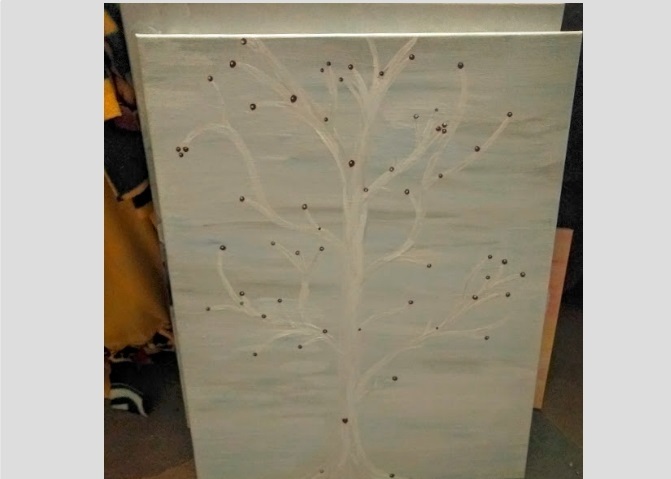 One, I thought a winter tree set against a light blue-gray background would look pretty. Two, I wasn’t completely happy with the rainbow of ornaments on a previous canvas and needed to try again. Practice makes perfect. My second love key embellishment needs one more coat of red paint before I stick it to the fourth and final winter tree canvas. The winter tree with the black and yellow ornaments will be a present for a Hawkeye fan. 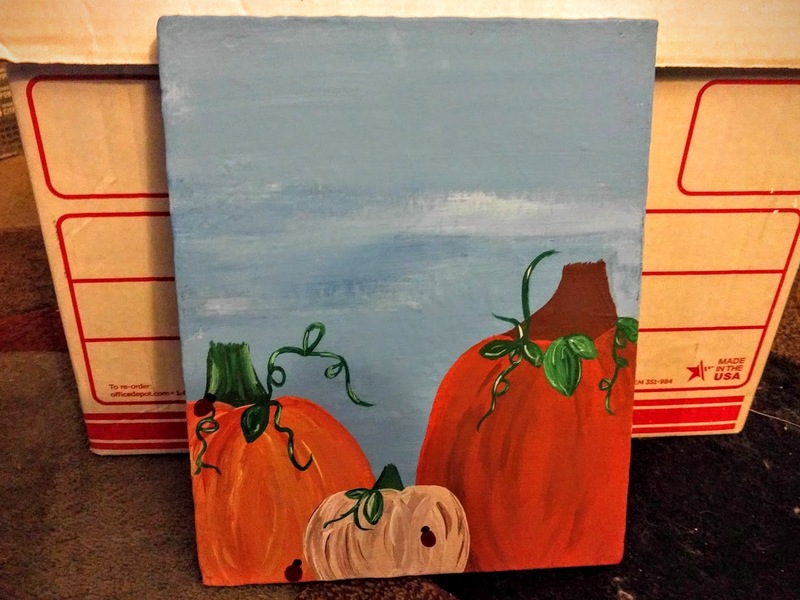 HELLO FALL: When I wrote the first post about my new work, this pumpkin painting and the two winter trees were hanging out in the trunk of my car (I had used them as examples for a previous party). I haven’t decided whether or not I like my pumpkins — I just don’t know! I do know painting pumpkins wasn’t as easy as I thought it would be. Anyway, I need to make a decision on whether to hand paint “Hello Fall” or buy pretty letters to paint and glue. 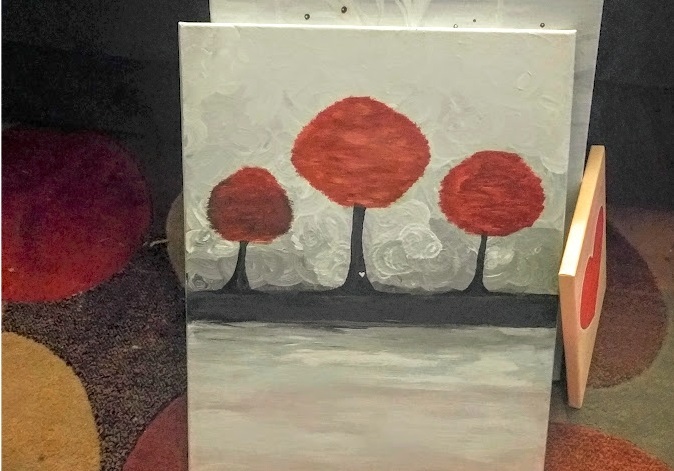 THREE RED TREES: I think painting the background was the easiest part on this canvas. Blending a mix of white, black, red, and brown created a nice forefront, and using a ruler on the blended black area would’ve prevented me from painting a crooked black width and taking about an hour to fix it. I have not quite perfected the art of creating tree leaves as I repainted the leaves about three times until I was completely satisfied with the result. WHITE TREE WITH WINTERBERRIES: I’m happy with the final look, but the background could’ve been a bit darker. I tried dotting the background with white specs to create the illusion of snow, but it just didn’t look right. So, I grabbed some clear glitter paint and tested it out on a small area of the background, fearing the glitter would sparkle way too much. Thankfully, the glitter is subtle and adds the right amount of winter sparkle. Cuuuuuute! If my girls and I had time to paint, we totally would! Lovely.